CONAPESCA, SEMARNAT and the State of Baja California Sur have worked collaboratively with Earth Ocean Farms, a leader in open-ocean aquaculture, to promote a model for sustainable aquaculture in Mexico. 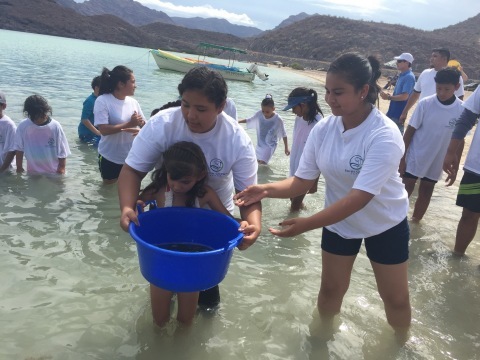 LA PAZ, Mexico--(BUSINESS WIRE)--This afternoon SEMARNAT, CONAPESCA and the office of the Governor of Baja California Sur joined forces with Earth Ocean Farms to release 40,000 juvenile totoaba (Totoaba macdonaldi) in the Sea of Cortez with the goal of re-populating this species which is at risk of extinction due to overfishing for its illicit commerce. The totoaba release was undertaken along the shores of Playa Santisapac on Concepcion Bay located in the Municipality of Mulegé. This is the fourth time that totoaba have been repopulated in the waters of Bahía Concepción. The first release occurred in December 2015. The Concepcion Bay site was selected as it is within the geographic range of this endemic Sea of Cortez species. Since 2013, the totoaba has been bred and raised in a sustainable way by Earth Ocean Farms, a marine aquaculture company based in La Paz, as part of an innovative plan to help the totoaba recover, while also creating jobs and helping to expand and diversify the state’s economy. The company operates a marine hatchery in Pichilingue and an open ocean farm within a 350-hectare marine concession located about 50km north of La Paz. "Our vision is to protect this species for future generations while also developing the mariculture industry of the State of Baja California Sur and Mexico. With the leadership of SEMARNAT, CONAPESCA and the State of Baja California Sur, Mexico has the capacity to generate additional jobs in the field of aquaculture, while also offering Mexican families a nutritious and reliable source of protein that contributes to the conservation of a species at risk of extinction," observed Pablo Konietzko, Director of Earth Ocean Farms. Mexican Secretary of the Environment and Natural Resources (SEMARNAT), Rafael Pacchiano Alamán, congratulates this fourth release of juvenile totoaba, expressing his appreciation for the joint efforts of authorities from the three levels of governments along with the nonprofit sector to support the recovery of this species through sustainable techniques, such as aquaculture. Secretary Pacchiano stressed that this effort is aligned with the objectives of the 2018 Strategy for the recovery of the vaquita and totoaba noting, "What we are looking for is a sustainable use of the totoaba to control the illegal trafficking of the species while also helping the communities of the Upper Gulf of California." Mario Aguilar, National Commissioner for Aquaculture and Fisheries, observed in relation to the fourth release that, "the re-population of totoaba through aquaculture is important because it complements the Integral Strategy for the Recovery of the Vaquita Marina in the Sea of Cortez. For this reason, the release represents the significant role that aquaculture projects can play to find viable alternatives in this area." With this action, CONAPESCA once again confirms its commitment to work in coordination with the private sector, represented in this case by Earth Ocean Farms, and with other federal government agencies, to ensure the sustainability of marine species in waters under federal jurisdiction, specifically in the Sea of Cortez. Earth Ocean Farms (EOF) is an innovative aquaculture company located in Baja California Sur focused on bringing environmentally healthy fish to market, making use of advanced, state-of- the-art and sustainable technologies in the area of open-ocean aquaculture. For more information about Earth Ocean Farms, visit http://earthoceanfarms.com/. This afternoon SEMARNAT, CONAPESCA and the office of the Governor of Baja California Sur joined forces with Earth Ocean Farms to release 40,000 juvenile totoaba in the Sea of Cortez.